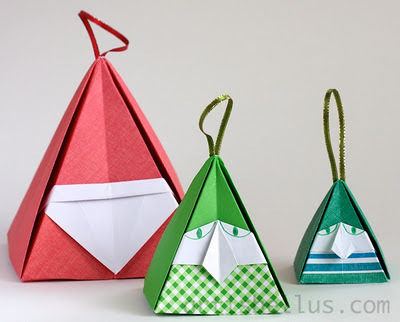 Paper: Commercial origami paper is handy as it is already cut into squares, but you can also use copy paper, magazine papers, recycled paper, scrap paper, artist papers or any paper that can hold a crease reasonably well and it's not too thick. Plain surface: Although you can fold in the air, it will be easier for beginners to fold on a plain (flat) surface. Perception: Learn the symbols. Be sure that you start with the right color side up or down and if you should be facing the edge (horizontal position) or the corner (diagonal position) of the paper. Look carefully at the instructions. The written instructions will give you extra hints. Preview: When folding a step, it's always helpful to look at how the model should look like in the next step. Prescience: Read ahead in diagrams to see what is coming up. It makes the current fold easier to understand. (Thanks to Breadbox). Precision: Fold as precisely as you can. Position edges and corners carefully before making your creases sharp. Practice: If you get stuck in the middle of the model or if it does not look as it is supposed to, try unfolding one or two steps and try again. If that does not work, leave it, do something else, and then start again with a new piece of paper. Perseverance: Don't be discouraged if your first try isn't perfect, it'll surely be better the second try. People: Meet other people who likes origami. Origami is something to share, teach and learn. Join an origami group, go to conventions, participate in the origami email lists, blogs, sites, contests (Thanks to Breadbox). Perfection: Something to strive for. Repeated folding, not giving up, will lead to the perfect completed fold (Thanks to Kathy Knapp). Patience: Don't rush through the fold. Take time to be precise (Thanks to Kathy Knapp). Any other origami P's you can think of? Let me know and I will add them to the list. Congratulations for your site , i like very much origami , Good Luck!! I like the list of P's. I'll share them with my origami group. You seem to have covered a lot of area using those "P" words. Breadbox, thank you for your comments. I liked "People" a lot, I think origami is a lot about sharing. I added "Prescience" and "People" to the list. King Tut is my favorite. very well done! Sort of a "P" : Put Pride Aside and Plead for help if necessary. In other words, don't be afraid to ask for help on blogs etc, people are always willing and eager to try to help. Thank you Frances, I'll add those words to the list. Patience - Don't rush through the fold. Take time to be precise. Thank you Kathy, I'll add "patience" to the list. Perfection - is something to strive for. Repeated folding, not giving up, will lead to the perfect completed fold. Thanks Kathy, I like it! In marketing concepts there are 4Ps. 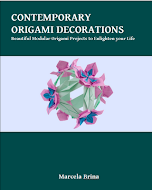 Product: The Origami aspect. Price: It is priceless, Place: Anywhere the origami artist pursues his or her enthusiasm if interest. Promotion: Spreading the folds.